”In one moment, every drop of blood in my body was brought to a stop by the touch of a hand laid lightly and suddenly on my shoulder from behind me. I turned on the instant, with my fingers tightening round the handle of my stick. There, in the middle of the broad, bright high-road – there, as if it had that moment sprung out of the earth or dropped from the heaven – stood the figure of a solitary woman, dressed from head to foot in white garments, her face bent in grave inquiry on mine, her hand pointing to the dark cloud over London, as I faced her. I was far too seriously startled by the suddenness with which this extraordinary apparition stood before me, in the dead of night and in that lonely place, to ask what she wanted. The strange woman spoke first. A damsel in distress is irresistible to most men, but impossible to ignore for men of good character. Hartright is still reeling from her ghostly appearance out of the gloom and dark of night, made more dramatic by her pale apparel. Before he can assemble his thoughts, she is in a carriage being spirited away. Men appear quickly behind her, whom he soon learns are chasing her. Hartright makes every effort to catch up with her to offer her further assistance, but does not find her. Hartright is left with a mystery, but will soon discover that this mystery will become an obsession as the woman in white proves inexplicably to be tied to the woman he will fall in love with. He takes a job as a drawing master, instructing two half sisters as different as night and day. One is fair, and one is dark. One is pretty, and one is...well...unattractive. The word ugly is actually used, but once I learn of Marian Halcombe’s character, it is impossible to associate such a hideous word to such a lovely person. Hartright, of course, falls in love with Laura Fairlie, the fair and beautiful one, an heiress, an orphan, a woman in need of protecting. Unfortunately, fate has conspired against them. She is promised to another one, the odious Sir Percival Glyde. Glyde is in serious financial trouble and needs her fortune to keep his creditors from dismantling his estate brick by brick. His closest friend is an Italian named Count Fosco, who conspires with him in a most insidious plot to take everything from Laura including, quite possibly, her own life. I am a bit disappointed in Hartright. Laura is certainly in need of a white knight, but Marian would have been a woman to build a life with. He does love and respect Marian, but never sees her as a potential mate, even after he discovers that Laura will soon be unattainable. It is only a small disappointment. We all see ourselves from a very young age married to someone beautiful or handsome. Hartright, whose heart is always in the right place, is attracted to Laura’s beauty, but also to her vulnerability. Marian is neither pretty nor is she helpless. The twist and turns to the plot are wonderfully revealed. This is considered one of the first detective novels as Hartright does apply investigative methods to his research while attempting to thwart the plans of Glyde and Fosco. Wilkie Collins’s background in studying the law also becomes readily apparent at different stages of the novel. The writing style is true Victorian style. I must caution you: if you are not a fan of Charles Dickens or Anthony Trollope, you might find this novel difficult. I read the book mostly late at night with the fireplace crackling and popping next to me. The wind has been blowing steadily the last few days, and as it moved along the gutters and through the bushes outside my window, it created sounds that made me snuggle deeper into my reading chair and feel as much as possible as if I were in England in the 1850s. Collins does explore the idea of women’s rights. The law does not protect their rights in near the same fashion that it protects a man’s rights. A woman truly had to live by her wits to keep from being marginalized by the complete and nearly unassailable power of her husband or her father. Marian was a match for any man, but she needed much more than her intelligence to outflank the injustice and the discrimination under which she was forced to live. Collins was a bohemian who did not believe in marriage. He had no qualms about living with more than one lover at once. I’m sure Dickens marvelled at his ability to pull of this feat in such a conservative time period. They were good friends, Dickens and Collins, but there was a break in their friendship towards the end of Dickens’ life when he was working on the novel The Mystery of Edwin Drood, ”his last and unfinished novel, with its running and hostile allusion to Collins’ The Moonstone.” I can’t think that Dickens was jealous. He was the champion among writers at the time. 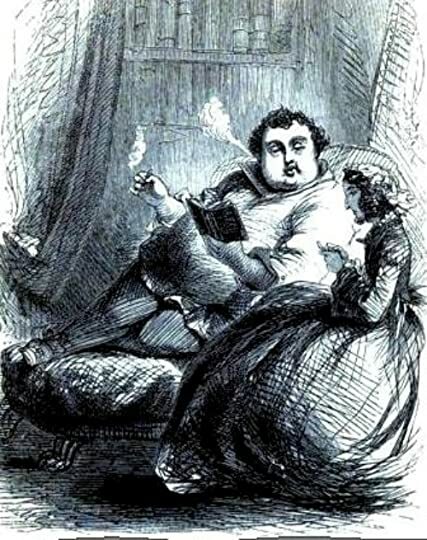 Collins fell out of favor over time while Dickens’ books soared. Only recently has Collins started to be regarded as one of the important Victorian writers. The Woman in White, as promised, does return to the plot, but you’ll have to read the book to discover exactly who she is, why she dresses in white, and what she has to do with the goings on at Limmeridge House? It is a chilling tale that must have elicited more than one gasp from the lips of Victorian women, young and old, as they discovered the truth behind the lies.